For all those players who plan to build a FIFA 19 Serie A squad, we’ve conducted an extensive analysis on the best players. 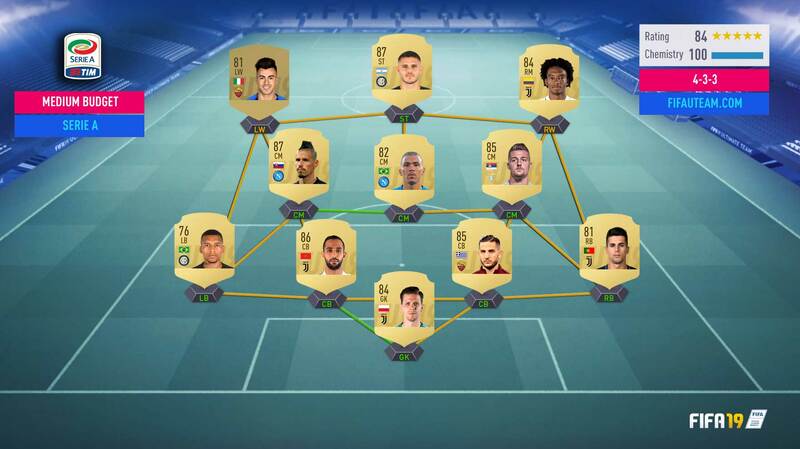 Here is our guide to the top Italian league in FIFA 19 Ultimate Team. All of these steps are necessary to have; or it could mean that the team is not always well built as it could be. This article aims to help those that want to form a FIFA 19 Serie A squad. Even the players that have a Serie A team, could take out some valuable conclusions from this guide that could help you make your team even better. Remember that this year, we published separate Serie A guides for each position. You can visit them, clicking in the colourful links in the top of this page. In this guide we didn’t consider players that have been transferred to other clubs or that have been reviewed (UP). Only players that started their season in the Serie A and with their original attributes were considered. In the chapter where FIFA 19 Serie A squads are suggested, we added a link where you can check anytime the updated prices. The Serie A is one of the most competitive leagues in the world, but the football is not as spectacular as it is in UK, Spain or Germany. The qualification of the champion is made through the made points system. Whichever team gathers the most points wins the league. The first three classified teams gain access to the champions league of the next year, while the fourth and fifth qualify for the Europa League and the last three trade places with the first three qualified from the Serie B. Every season starts in September and finishes in May, having 38 game weeks with ten matches each, being a total of 380 matches per season. The Serie A is the second best league classified in the UEFA league coefficient. Started in 1898, the Italian league has been conquered by sixteen clubs. The dominant club is Juventus, with a total of 34 titles. AC Milan (18), Inter (18) and Genova (9) are the other teams that have won numerous titles. Serie A is a good choice for those who are looking for quality players, but don’t have a large budget. There is not many choices, but the players in Serie A are probably the best value for money. The team suggestions that follow are simple graphic indicators of the Serie A articles already published. They should serve merely as orientation because it’s impossible to build a team that fits everyone. They depend on various factors we don’t know such as budget, formation, custom tactics, style of play and player preferences. The choice for this team’s players was based on the position guides published previously. Handanovic is one of the best goalies you can use in FIFA 19. It’s natural to see him on our unlimited budget squad. Chiellini and Alex Sandro are untouchables in any defence of this league. In our opinion, the other spots of the back line should be filled by Cancelo and Koulibaly. However, Manolas is also a great option. If you think that Napoli’s Centre back is not fast enough, even with the right chemistry style, then don’t be afraid to use the Roma’s defender. He is really fast and gives security to any defense. Nainggolan, one of the most versatile FUT 19 players, is a CM but he is better than any other native CDM of Serie A. We love his high/high work rates and amazing stamina. In front of him, Dybala is another top-quality player, making this midfield the strongest point of this league. Now something that you need to pay attention: who builds an unlimited budget Serie A squad shouldn’t pick a formation with wingers. We only did it because it’s our default formation, the one we use in every single guide. There are not many quality choices for this position. Cuadrado and Douglas Costa are the best ones. Matuidi, Sergej Milinkovic-Savic, Marek Hamšik and Miralem Pjanic are just a few examples of great players who have no room on this team because of the formation. In the attack line, Ronaldo is obviously there but the other player depends on your preference. Generally speaking, Mertens is the first choice but only if you usually don’t cross to the box. In that case, Immobile and Higuaín may be a better choice. The choices for this team were based on the position guides that we have published before. In goal, Szczesny is good enough to keep you safe. Benatia and Manolas are great examples of how it is possible to build a great team without paying too much coins. Cancelo (again) and Dalbert fill the other spots. The central midfield position of this team has to be assigned to Allan or Khedira. They build up the first barrier between your goal line and the opponent, making their physicality and defensive attributes count. Besides that, they start the attacks very well, thanks to their passings skills. Sergej Milinkovic-Savic and Marek Hamšik are not the cheapest alternatives to the two other spots on the midfield, but they add so much quality to this squad. On the wings, Cuadrado is cheap enough to keep his spot on the team but El Shaarawy only appears here because there isn’t anyone better than him, excepting Douglas Costa, Insigne and Perisic, and all of them are too expensive to this budget. 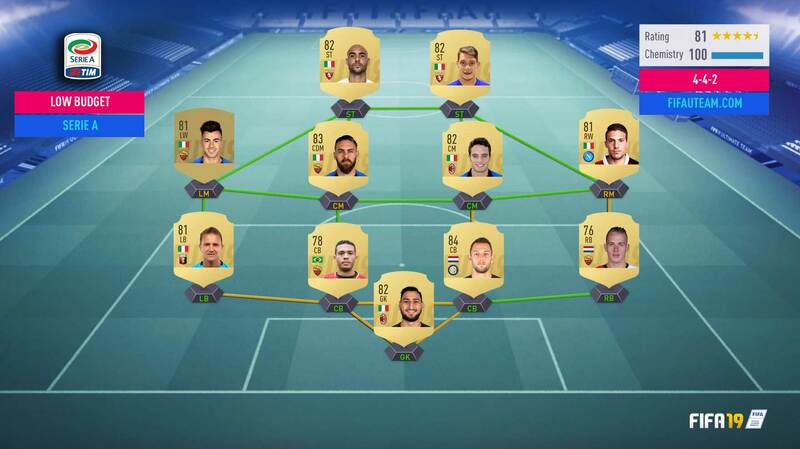 If you want to build a strong Serie A team without spending all your coins, you should try to find a formation without wings or, even better, someone from other league that won’t get low chemistry. Icardi is the ST of this team but, if you don’t have enough coins to buy him, you can replace him by Alejandro Gómez. If you still have some room in your budget, Perisic would improve this squad a lot. Once again, the choice for this team was based on our previous guides. Donnarumma is cheap enough to keep his spot in the team. Kasdorp, Vrij, Juan Jesus and Criscito complete the defence. In the midfield, Daniele De Rossi and Bonaventura complement each other well. The first one is strong, quick and aggressive, while the other one is a player that usually pushes forward to assist his colleagues. Castillejo and Perotti fill the wings in order to assist Lautaro Martínez and Luís Alberto. 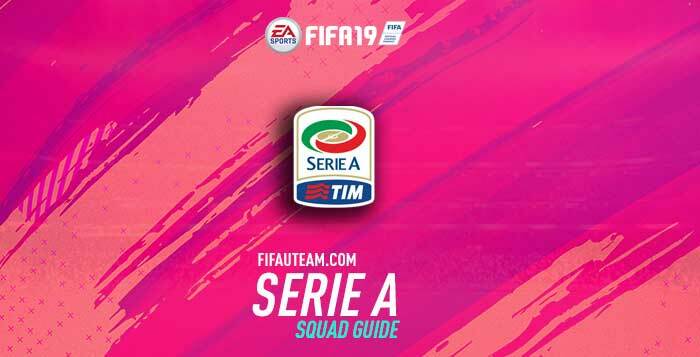 Follow our tips and you’ll become more successful on FIFA 19 Ultimate Team with your Serie A Team. I am looking for an expert serie A guy, seems you are my man. Plenty of good info here, looking forward to your comment. 1. Defense: Make defense better: maybe Nesta (90; then I need to sell some guys) or make an upgrade on Koulibaly? Some say, that De Rossi should move to CB position, havn`t done that yet. 2. Midfield CM/CDM: I think De Rossi is fine as CDM/CM, not sure if Matuidi is better than Khedira Futmas, Nainggolan (85) didn´t work for me (don`t no why), didn`t try savic, got luis alberto IF and he is no alternative for me. 4. ST: Dybala is mostly fine, but i am missing some alternatives. I had mertens in 4-2-3-1 as RCAM, but was very disappointed (maybe not the best position for him) and can not afford mertens carniball right now. Insigne is LW and small (nice one, but not a game changer). Integrate De Jong as CM (FS) with Tagliafico LB (UCL 86; need to buy) and Kluivert LW (need to buy) on the left side? A lot of alternatives, not easy to decide. Maybe you can give some pointers. Hi. In fact, my first team is based on Serie A. 1) Forget De Rossi. Chiellini is better than him. If you are not happy with your CBs, maybe you should save for an ICON. 2) I had to play around 50 matches with Naingollan until I understand how I could take the best from him. Matuidi is also a decent choice. 3) Again: Dybala is probably the best CAM of this league. I understand your point but no one is better than him. In my opinion, Mertens is ana amazing ST and that’s where he needs to play. 4) Give a try to Icardi. He is my best scorer. About you hybrids the third one is too expensive. The second one is the cheapest one and I would try that. When I use Calhanoglu to startup, I will take him and CAM to switch their position, he is too slow but excellent in shoot with both feet. 1. Suso (SIF,86) is good, but may cause the formation too narrow as his is good in shooting not crossing. Should I buy it. 2. I like 2 CDM, Nainggolan, Milinkovic, Matuidi, Bakayoko(IF,83). 2 of them? 4. Is Sandro & Cancelo (IF,84) necessary? As budget is limited, how could I upgrade my team? 3. I would use Mertens as ST but if you don’t, you need to use him as CAM. His brilliant. 4. Sandro is much better than any other LB. Cancelo is our favourite as RB. They do not play in crucial positions but try to use them if possible. Hi. What a team! I believe your weakest player is Florenzi. Cancelo IF would be a good replacement. That’s the most important. If he is working to you, then keep with him. If you like Florenzi, I think Florenzi UCL Live is best choice. Roma have won 1st leg, and probably beat Porto again. The Florenzi may increase to 88 and become the best DR in game. Hey man, loved the guide. I’m a bit stuck on how to structure my team and dont know a decent formation that would work for it. Anything i can add or takeaway? Or decent formations that may help? Thank you. Your team looks great (in fact, it is very similar to mine). Assuming that you have a GK, you can try Dybala on the midfield but there is no much more you can do to improve it without spending a fortune. Hi Rodrigo. I have been building a seria A team with a 433(4) formation. I spent most of my coins now, but will start to save more soon. The team behaves wonderful at least on my level, so I am not sure what to do with the next coins I may save. I am not sure if Mautidi can be better CM than Milinkovic-Savic. Or if buying any of the top 3 CB will make a lot better than Kouli or Manolas which are great. I know Cuadrado will improve the RW, I will go for him first. But other than that not considering CR7 or Dybala, I cannot see anything to improve. Do you agree? Hi. There is (almost) always room for improvement. In my opinion, Chiellini is better than Manolas (yes, it will make a difference). Matuidi and Savic are too different: the first helps the defence, while the other one scores many goals and also assists his teammates. It depends on how much attacking you want to be. I also agree that Cuadrado is much better than Bernardesch. Later, you can also think in Cancelo and Handanovic. However, keep in mind that, if the team is playing the way you want, you should be careful with your improvements. Thanks for the advice. I will save for Chiellini. Savic looks good there even if he’s not too defensive, Nainggolan balances the midfield well for now. I have not had much luck with this team. Should i look to replace anyone or try out a different formation? Any suggestions? I would drop Joa to RB. Get either cuadrado or balde for your RW or even Verdi. Maybe get rid of khedira and get nainggolan. Good luck! There are a few things you can do first, like replacing Khedira by Nainggolan, drop Cancelo to RW and get Cuadrado for that position. Hello, I am unsure on where I can go to make my Serie A team better knowing that I can’t afford Ronaldo. Please let me know where you think I can improve? Whether it be in player selection or formation or both. Hi. I have a team very similar to yours, so I know what you are feeling. It’s not easy to improve it without spending many coins on ICONS or special/IF cards, which most of the times are not good value for money. Sub + Res: GK Szczesny CB Manolas, Bonucci, De Vrij LM Insigne CM Matuidi, Milinkovic-Savic, Joao Mario (IF) RM Callejon CAM Mertens ST Icardi, Lasagna (Swap Reward). I’m thinking of changing formation to 4-1-2-1-2 but not sure because of average wing backs. But I’m rather tired of playnd 3 CBs.. So, could you, please, tell me what is the right way to move to new formation and if there are possible implrovements to the current one. P.s. I’ve read about Mertens as ST, but I usually make a lot of crosses, that’s why I use him as CAM in rotation with Dybala. Hi. Except Ronaldo, no one is a better ST in the Serie A than Mertens. I understand your point, but have him on the bench doesn’t make sense to me either. Maybe you should try 41212 (2). In that case, you will need Cancelo and, if possible, Alex Sandro. Good luck. Thanks, I will try 41212 (2), if possible, could you suggest squad for this formation? Ronaldo is too expensive, unfortunately. Handanovic, Cancelo, Alex Sandro, Chiellini, Koulibaly, Matuidi, Nainngolan, Dybala, Hamsik, Dybala and Mertens. You can also use Pjanic, removing Matuidi from the team and using Nainggolan as CDM. Hello Ilya! Put Icardi in front he is crazy good! I play with a lot of crosses too and have a 4-3-3 formation my wingers are Perisic and Cuadrado all three of them score lots of headers! Hi. You have a great squad. To be honest, I believe Matuidi may be better than Fabian but you probably have a different opinion. What do you say about Aguero + Icardi? I bought the two and i can say they’re absolute monsters scoring ratio doesn’t go below 1 GpG. I’m playing Aguero as ST, Icardi RCAM, Dybala CAM and finally Mertens LCAM and it’s a perfect attacking combination. So cheers again mate for the great suggestion!!!! Hi. Yes, Mandzukic can’t play in that position. I love Icardi but he will not play at his best as a CAM. You have the option to buy Matuidi for CDM and place Nainggolan as CAM but you probably will want someone faster. In any case, you should also think in Hamsik for that spot. Hi rodrigo, i am using this 4-4-1-1 formation and i want to change this formation. Except the 4-2-4, can you please suggest me any other formation and the players i should use. Hi. Have you tried the unlimited budget squad suggested in this page (replace Ronaldo by Icardi or Immobile)?! Thank you. I will definitely try this. I am struggling to upgrade my team, I have this so far but want some inform players to boost it a bit more. Hey, my friend also has a team along the lines of yours. I would suggest inform koulibaly, inform suso is also very good for subs. I would also recommend inform 86 cancelo as right back. What a team! You probably love Immobile because I can’t find any other reason to see him in a team like this one. That should be your priority. The Hamsik and Koulibaly cards you have talked don’t represent an important upgrade. Hey rodrigo, I have recently made a pretty good seria a team with a mediuim budget I would say. I will put koulibaly in the cb empty spot once i have enough coins, after I do this what are your suggestions for my full backs along with my midfielders. I play a lot of through balls, and take a lot of finnese shots near the 18 usually playing long balls if I am playing on the wing. What are your suggestions. Hi. Yes, Koulibaly would be awesome. Cancelo is great but Alex Sandro is probably too expensive to the left side. right? In that case, Dalbert can play on that spot while you are saving more coins. On the midfield, I believe the only change you can try is Douglas Costa or Insigne to replace Perisic. Hey rodrigo, thanks for the reply, I looked at the possible options of replacing perisic, I might go with Costa, I am very ambitious from outside the 18 with finesse shots, will douglas costas shot get interfere with my play style. I played dozens of matches with him (probably hundreds) and I’m still not convinced. That’s the only player that still has something to prove to me. I keep rotating between him and Insigne. He’s (just) decent outside the box. You can try something similar to the medium budget from this guide. Rest of them are s*it from other leagues. I want to play 4-1-2-1-2 and sometimes to swap in 4-2-3-1 or something similar. As CDM, should i buy Matuidi or Nainggolan? As CAM, which is the best CM to play CAM? As CM, should i play with Cuadrado and Costa as CM (NOT RM OR LM)? And should i buy Savic and Pjanic / Nainggolan to replace them sometimes? I saw that Savic is cheap, but i dont know what should i chose between Pjanic and Nainggolan. Hi. Forget Albiol. You have plenty of better options on this league (Koulibaly, for example). Matuidi is great to play as CDM. Pick Nainggolan. Icardi and Mertens are two great ST in this case. So basically in-game bakayoko switches with mertens. Hi. The most defensive midfielder must play in the middle. In this case it’s Matuidi. Hi! I have 600k and want to build a Serie A XI, who should I go for? I’m used to playing 4-3-3 with an CAM but should I change to 4-1-2-1-2?? Thanks! Hi. Keep the formation you are used to, and only try another one if it doesn’t work (be sure to adjust the instructions and the tactics first). You can try something like Handanovic, Cancelo, Koulibaly, Chiellini, Alex Sandro, Naingollan, Matuidi, Dybala (CAM), Cuadrado, Diego Costa (or Insigne) and Mertens. I hv exacly the same team only i have choose for better header higuain st and mertens as cam, is that good or do i really hv to get dyabala instead? It depends on your play style. If you cross a lot to the box, you have made good choices. Otherwise, Mertens is a better ST than Higuain. Dybala is great but too expensive when compared with Mertens or other skilled players. I have a hard time deciding who goes where. Often the small fast players never win duells and get tackled easily. Therefore they end up on the bench. I have tried Douglas costa on RM and perisic LM. It works but there are no cards to make it go with the chem. I dream about Ronaldo and dyabala, but they are just to expensive. Do you have any suggestions to what I can do to settle with my team? Hi. I play with a Serie A squad, so your issues are familiar to me. I believe that Matuidi or Nainggolan could be good improvements to your midfield, keeping Cuadrado on the right and D Costa on the left (in fact, Insigne he as good as he is). and i want to buy dybala to CAM, and I need some sugesstions what playes to change or maybe formations… if someone have time to answer formations and best player change. I would change formation to 4-4-2 personally sell bonnuci and get manolas, get Cuadrado for RM, get Szczsney instead of Sirigu. What console are you on, if you want and you are on Xbox add MM7Games21 and I can tell you everything that you need to know. Szczesny, Cancelo, Koulibaly, Manolas, Dalbert, Niangollan, Savic, Cuadrado, Insigne, Icardi and Mertens. You can use these players in almost every 4xx formation with wingers. 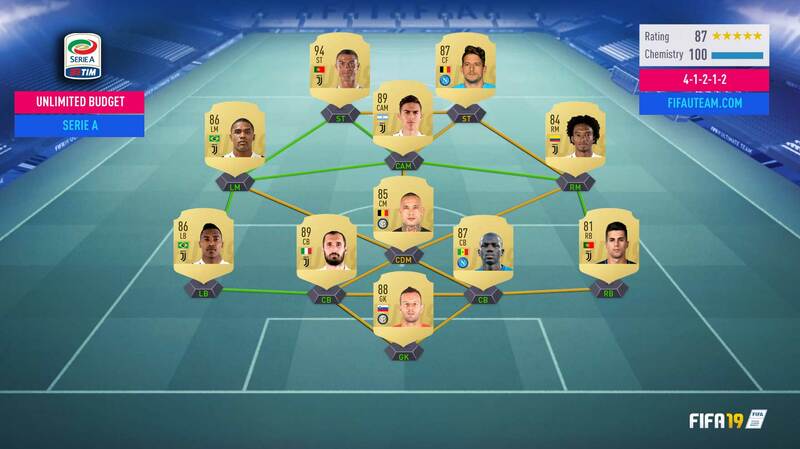 @Rodrigo Lopes (Admin) Can you please build me a squad with Heung min son, roberto firmino and Arias, all futmas. I have around 500k, and if it helps i have tottenham dembele UCL and have gotze flashback + Lerma swap player + Lucas POTM + Zaha Futmas. Only thing i need in the squad are the first 4, the other ones can maybe help you a little. I would like a pacy attack too. Hi, can somebody give me advice about who to buy next? I am thinking about Dybala, Chiellini, Cancelo TOTW or Nainggolan.. but I don‘t know which one i should buy first for my Team. Or would you buy someone else first? I would buy Icardi who is much better than Gómez and cheaper than the ones you suggested. Matuidi, Nainggolan and Chiellini are other decent options. Nice team. Insigne ST looks a great card. I don’t think Pjanic would help you. Go for allan as CDM and use merterns as CAM he is great and you can try Ciro immobile, or Bellotti IF as ST.
Me too. Best value for money, every single year. Unlimited 424? I can tell it if not considering IF and special cards. In fact, it would be exactly the 41212 suggested in this page. Yes, Dybala as CM but you need to be sure the other CM has good defensive skills. Are u on twitter where I can dm u? If you don’t have money for CR7, then it makes sense. My current team feels solid but i’m not a fan of immobile. Can you recommend a pacey striker with decent shooting and dribbling? I have tried Mertens as ST but his strength is far too low. I would also appreciate recommendations for other positions. Hi. I’m not fan of Immobile either. To be honest, my greatest scorer is Icardi. He may not be the best (he isn’t) but for sure the best value for money. However, in your case, maybe Dybala as ST would be who you are looking for. I also recommend Koulibaly, Chiellini, Handanovic, Matuidi and Douglas Costa. Curious on what route you would go with if you were in my shoes. I am debating between continuing with my Serie A squad or trying to switch over to a La Liga side. My reasoning is that other squads I have been playing lately are getting some very overpowering defenders and with “Shadow” they are equally as fast to my attackers but my attackers lack any strengths to hold them off (martens, insigne) or are slower and weaker than them (immobile, icardi). My playing style is to sit in on defense with the strong back 4 and 2 CDM holding the middle of the park then breaking out on a counter with my CAM and 3 attackers sitting up the pitch. I currently have a budget of 170,000 coins, and a squad with over 500 players which I could easily sell off or use for the Toni Kroos SBC right now. Subs/Reserves: Immobile, Cuadrado, Skriniar, Costa, Icardi, Hamsik, Callejon, Benatia, Florenzi, Bonucci, Miranda, Kolarov, Pjanic. OR should I continue with my Serie A side and just work for an Icon or two in the attacking positions? First of all, let me say that my personal team is basically the one you are using. I had the chance to build a squad from other leagues but I decided to keep with my Serie A squad. Usually, I think we should go for the squad with as many NIF cards as possible. However, this Serie A squad is pretty good (I play in 424) and it may work better than your suggested LaLiga squad. Sell the players you don’t want (do it fast because prices are dropping) and save coins to make a few adjustments. There will be always chances to improve it. For example: right now you can get Insigne ST 90, which is ana amazing card (yes, too expensive but other cheaper alternatives are also available). Hi, you mention building the best Serie A team, you wouldn’t necessarily play diamond. What formation would you play which who where? Currently playing 4-3-3 just be interesting to know your thoughts. Hi. To be honest, my main squad is from Serie A and I use wingers. 🙂 I play in 424 and I’m loving it. However, it depends on your style. 4312 looks to be an interesting formation to try using Serie A players. Can view the premiership teams because of the stupid scrolling ads banner. Hi. We are strongly committed to providing the best user experience possible. Can you please provide more details or eventually a screenshot of your issue? What premiership teams were you talking about? Great guide, it helped me a lot with serie a squad grow stronger. Any chance for update with upgrades of colored cards please? Yes, we did. You are only seeing the last part of our guide. Check them here. Hi, great guide, useful as always. Just a little mistake in the intro: the first FOUR team qualify for Champions League.